We stayed in Adagio Hostel 2.0 Basilica which was located on the main boulevard Andrassy Street, and ended up being a perfect location to explore the city from. It had an amazing view over the road from the kitchen balcony as you can see (above), and it was really comfy and modern. I would definitely recommend. Opposite was a Costa (useful to stumble into in the morning for an oat milk coffee fix, though I admit I don’t usually like Costa), and the ‘Akvarium Klub’ with the shallow pool on top and Budapest eye are opposite, and seem to be where locals and holidaymakers alike congregate to have a drink in the evening. My personal highlight and the attraction Budapest is famous for, the baths are definitely worth a day trip! 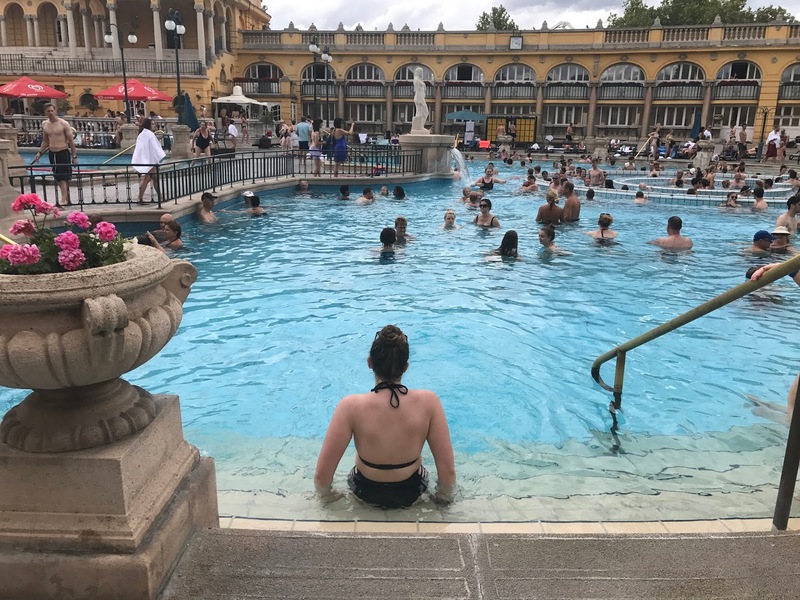 We went to Szechenyi Baths, the largest with 18 pools, including the beautiful outdoor ones with a lazy river and jaccuzi. The indoor ones ranged from a really cold plunge pool which takes your breath away to pools over 40 degrees, though they do have a slight sulphur smell to them. Outdoors there were even some locals playing chess! One word of advice in summer is to get there early to buy a locker ticket – we ended up having to buy a cabin which was only £1.50 more expensive but not really necessary. The day pass is equivalent to £11.30, 50p more on weekends, and includes a locker. It was a nice 40 minute walk from our hostel, though we could have easily got public transport! Spa parties are also held here at weekends, though we didn’t get a chance to go to one of these, and to be honest I still can’t decide whether it sounds fun or really gross- probably a mixture of both! The ruin bars are a must see, and we went to Szimpla Kert, which I think you could go to hundreds of times and still see something new (And yes, this blurry picture is all I managed). We went at night, when it was packed mostly with travellers, and had a great party atmosphere with loads of different rooms, bars and DJ’s all with different vibes. If I went again I’d definitely check it out in the day too, to really see all the décor! The only downside was that the drinks are pretty expensive. One of the best things about crossing the river to Buda is the Szechenyi Chain Bridge and the views you get (though if you between midday and late afternoon be warned it’ll probably be way too busy to stop!). Across the bridge, on the Buda side, there is Buda Castle and the Liberty Statue, both of which offer amazing views and are worth going to! You can see everything including all the bridges and the impressive houses of parliament. We went to the Castle on a free walking tour and they took us to the free part where you can look over the entire Pest part of the city, and the walk up to the Liberty Statue was actually really enjoyable also. Though one local did refer to it rather disparagingly as the ‘giant bottle opener’ and now that’s all I can see! Due to a lack of funds/budgeting well I’d pretty much spent all of my money by this point of our trip and we were only really eating out once in each city, so most of my food (that bread roll, jam and crisps life) came from the Aldi about 10 mins from our hostel. However, the one place we went was Hummus Bar which sold absolutely massive and very reasonably priced bowls of hummus and fresh pitta. I had falafel and hummus (chickpea overload haha) and wholemeal pitta and it was so yummy – really similar vibe to Humpit for any UK people in Sheffield/Leeds area. So I’d definitely recommend a visit. It looks as though there are loads of places though – check them out on happy cow! Some other things worth checking out are firstly the massive neo-gothic market hall, which is worth going into just for the sheer size of it! All of the churches are worth seeing as well, including the above, St Stephen’s Basilica. I hope you enjoyed my overview of what I did in Budapest. Have you ever been and did I miss anything you think is a ‘must do’? Let me know! !